I have been formulating this idea for quite some time and now think I have come up with a possible solution. For sugar dusting to be reasonably effective, it needs doing at least every four weeks, spring through summer. I have always been a minimum intereference advocate and I made it known that IMO this was too disturbing. So I got to thinking, how could we administer sugar powder effectively without too much disturbance. This is what I came up with. Looking at my crude drawing, first you can see the appliance from the top, its basically a rectangular funnel. Then a cross section, the gap at the bottom is only about 4mm wide. The overall length is the same as a Top Bar. The last part of the drawing (apologies, am using windows paint)At both ends there is a small wedge shape, something like a protruding nail with a maximum width of just 4mm. By forcing these end wedges between the first Top Bar and the follower board, a gap is formed between the bar and the follower. The gap is insufficient for any bees to come up. An amount of sugar powder is brushed into the funnel to fall down onto the bees taking off phoretic mites. The appliance is then moved to the next join between the first top bar and the second. The first bar will slide up to meet the follower board. The next application can be made. And so on until the last bar is reached. All the bars should now be closed up as part of the process. Sugar powder will trickle down between the bees on the combs like pennies in an old penny slot machine. Obviously this cannot be done with hundredes of colonies but for us hobbiests it is time well spent. I like Randy Oliver's approach to biotech methods of Varroa control. 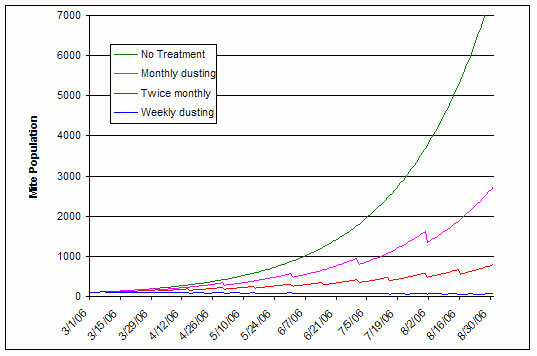 His simple graph shows the value of this 4 weekly sugar dusting. Combine this with 1 hour mite count after dusting to establish approximate phoretic mite numbers (about one third drop within one hour) to ensure you can wait a further 4 weeks till next dusting. In spring insert a top bar with a whole sheet of drone foundation cut to the section of the top bar hive at the edge of the brood nest, then 28 days later at the time of the first dusting, take out this bar and replace with another and repeat both sugar dusting and drone removal every 28 days. Randy calls it The One-Two Punch. That looks good, Norm, and may well be more effective than blasting it up from underneath, as I have been doing. I am coming round to the idea of using gapped bars over the brood nest as standard - hives I have tried it on this year have suffered much less from cross-combing - and they also make it easy to brush powdered sugar down from above. That looks like a great idea! But I just don't understand the purpose of the funnel. Couldn't you just seprate the bars alittle [not enough for bees to get out] and brush powdered sugar into the gaps? Otherwise, this is a great way to dust with little interferance. Yes you are right beesilly, you could just open up the top bars and brush sugar powder down into the gap. This just makes it much quicker and easier and less of a problem if its windy. The gap of the funnel is slightly less than the gap opened up between the top bars by the wedges. (By the way I used screws for this then filed them to the correct shape). I will be using it in anger for the first time tomorrow. Do you worry about the powdered sugar affecting the content of the honey crop? Or is this nothing to worry about? Since it is repeated applications, it would probably occur throughout the honey flow cycle. Using powdered or icing sugar is a well documented and accepted form of varroa control because of it's non contamination of either honey or wax. Sugar is a natural component of honey. Posted: Sat Feb 08, 2014 10:08 am Post subject: How did it go? I realise this is a very old post but I thought I'd try my luck - this looks like such an interesting idea, I'd really like to know how it worked? I just did my first sugar treatment today and it went OK, I just separated all the bars a little and poured a cup of icing sugar over, then brushed it into the gaps. But the bees got a bit upset, I think this might be a much smoother technique. Is it worth the build?